194 pages | 55 B/W Illus. Software is cut-and-dried – every button you press has a predictable effect – but qualitative analysis is open-ended and unfolds in unpredictable ways. This contradiction is best resolved by separating analytic strategies – what you plan to do – from software tactics – how you plan to do it. Expert ATLAS.ti users have unconsciously learned to do this. The Five-Level QDA® method unpacks the process so that you can learn it consciously and efficiently. The first part of the book explains how the contradiction between analytic strategies and software tactics is reconciled by "translating" between them. The second part provides both an in-depth description of how ATLAS.ti works and comprehensive instruction in the five steps of "translation". these steps are illustrated with examples from a variety of research projects. 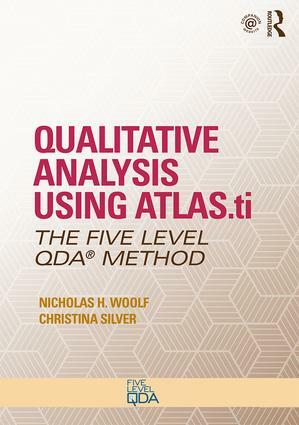 The third part contains real-world qualitative research projects from a variety of disciplines, methodologies, and kinds of qualitative analysis, all illustrated in ATLAS.ti using the Five-Level QDA method. The book is accompanied by three sets of videos demonstrations on the Companion Website. While this book uses screenshots from the current ATLAS.ti Version 8, it is still fully applicable to users of older versions. The Five-Level QDA method is based on the authors’ combined 40 years of experience teaching ATLAS.ti and other software packages used as platforms for conducting qualitative analysis. After many years observing their students’ challenges they developed the Five-Level QDA method to describe the process that long-time ATLAS.ti experts unconsciously adopt. The Five-Level QDA method is independent of software program or methodology, and the principles apply to any type of qualitative project.